Easy High Altitude Ascents in Northern Chile. EXPEDITION FULL - THERE ARE NO SPACES REMAINING ON THIS EXPEDITION. 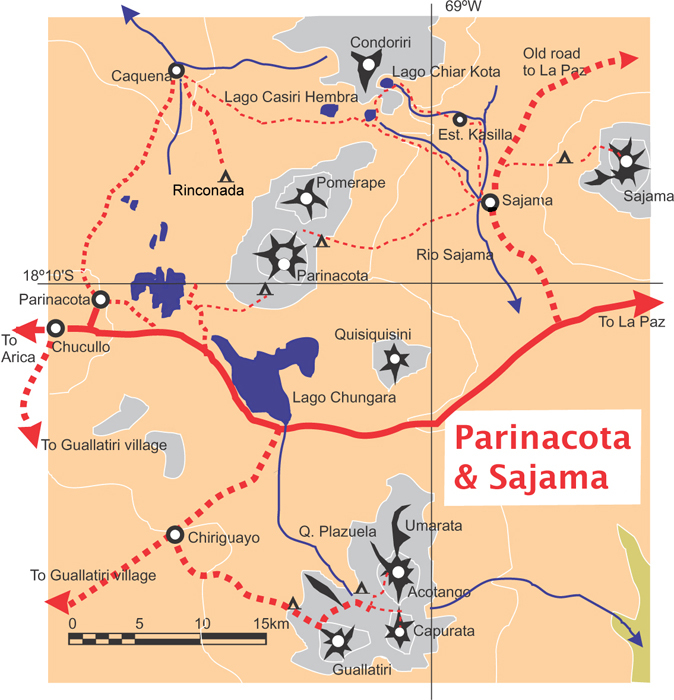 Day 4-6 Acclimatisation around Parinacota, including ascents of Guaneguane (5097m) and Choquelimpie (5298m). Day 7 Drive to Volcan Guallatiri base camp, rest and prepare. Day 8-9 Two potential summit days on Volcan Guallatiri (6063m). Day 10 Travel back to Arica, with time for an afternoon swim in the Pacific. 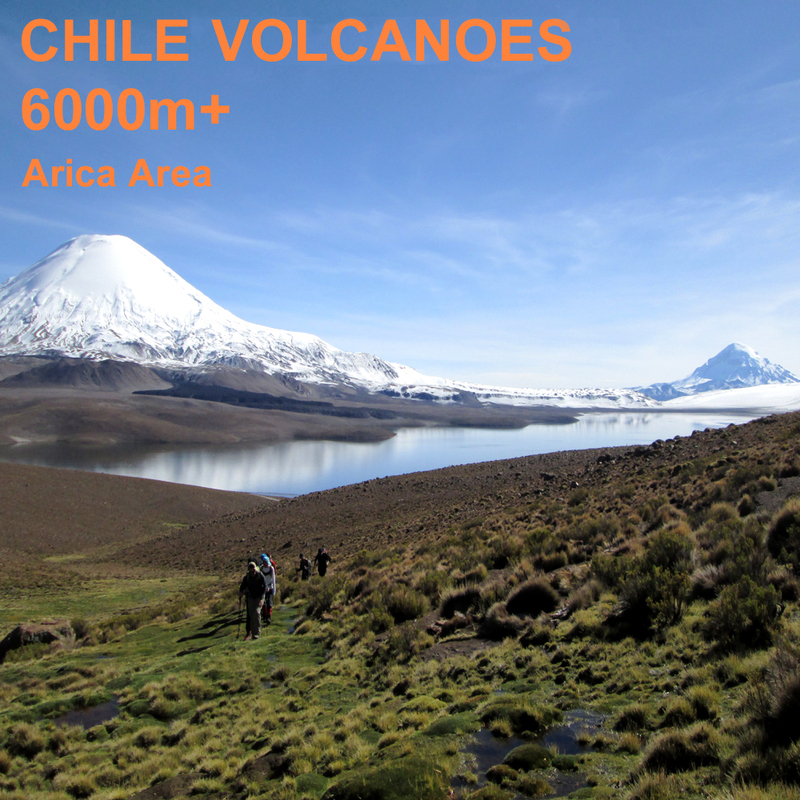 The expedition will fly out to the coastal city of Arica in the extreme north of Chile via the capital Santiago. It's a biggish city with a long beach front, popular with Chileans from Santiago during the summer months. We'll likely have an overnight here at the beginning and again at the end of the expedition, although this will depend a bit on flight schedules when we all book flights. 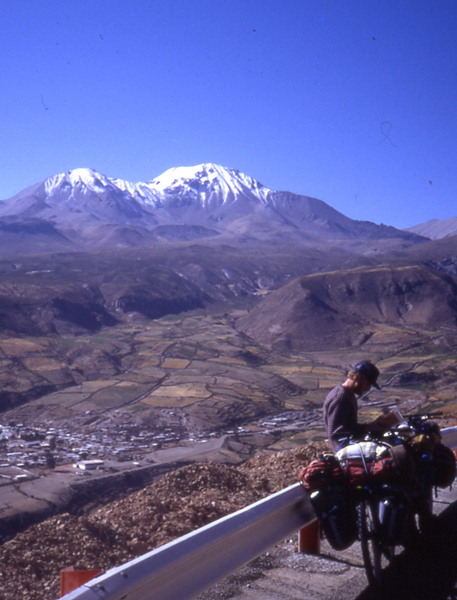 From Arica we will first travel to the mountain town of Putre at an altitude of 3500m, where we will spend two nights and two days acclimatising to the altitude. Putre is about 3 hours drive from Arica. The wee town of Putre and the Nevados de Putre, photo taken on our first visit there in 1991. 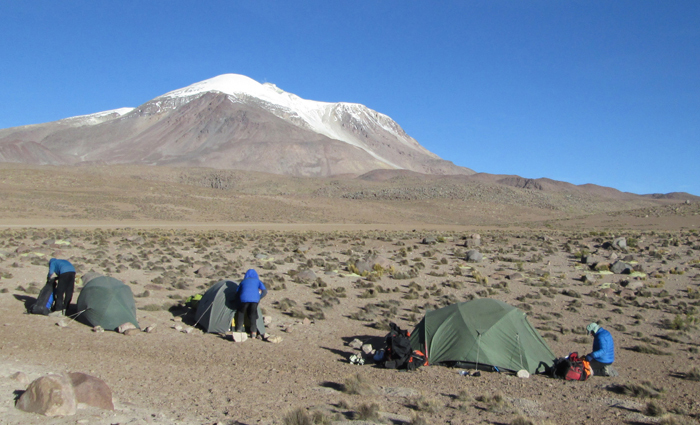 As we've done before on this itinerary we'll do a two night camp in the area of Volcan Parinacota, and make further acclimatisation ascents possible climbing as high as Cero Choquelimpie, a 5298m high hill. 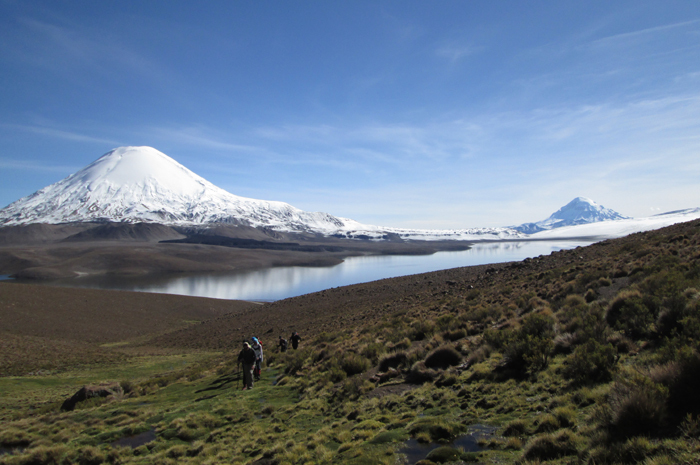 During this spell we will be camped beside Laguna Chungara at an altitude of about 4500m. Parinacota and Laguna Chungara from near our acclimatisation camp. The 6063m high Volcan Guallatiri is an active volcano very near the Chile-Bolivia border, but entirely in Chile. It is one of the more active volcanoes in this part of the Andes. We'll climb it by the northeast slopes, over snow and ice, from a high road end at about 5200m that we can reach with our 4x4 vehicles. This ascent usually takes about 6 to 8 hours, but with a much quicker descent. We usually camp a bit below the road end at an altitude of about 5000m. For more information about Volcan Guallatiri click here. Volcan Guallatiri from the north. Our route is roughly by the left hand skyline. Although there is no difficult climbing involved in the ascents planned on this expedition, climbing to such heights is still a serious matter because of the lack of oxygen at high altitude. For this expedition good mountain fitness and stamina are important, but for high altitude expeditions clients also need good cardiopulmonary (heart and lung) fitness. This can only be maintained, by a program of intensive exercise such as sprinting (not jogging), squash or sprint cycling. This should be done in small doses (e.g. half an hour every other day) over a period of at least two months. The climate at altitude in the northern Chilean Andes is very cold and extremely dry. In the mountains temperatures can fall to -10ºC at night. During the day in the mountains it can feel very warm in the strong sun, but it can also be bitterly cold and windy. It may be dry all the time we are in South America, but there is quite a high chance of a snow flurry, or occasional afternoon thunderstorm in the mountains. As we are near the tropics come prepared for about 10 hours of darkness every night. Temperatures in the valleys and around Arica and in other low lying areas will be a very pleasant 20-25ºC during the day. Our expeditions are designed to be small and flexible. The expedition will be co-ordinated, organised and lead by us, but we will consult and involve the expedition members when planning the day-to-day details of the trip. Please note however that the leaders decision is final where the safety of the group or any member is in jeopardy; for example where retreat or diversion is necessary due to illness or bad weather. Flamingoes on the Laguna Chungara. All clients must be insured for medical costs and repatriation in an emergency. We recommend having insurance for baggage, personal liability and cancellation as well. If you would like further advice please ask. Chile is a well developed country. Vaccinations for tetanus, typhoid and polio are recommended. The country is very safe and relaxing to travel in; theft and muggings are no more likely than they are in most of Britain or Europe. Extreme remoteness : You will be camping in a remote area for several nights and therefore obtaining medical assistance for any problem will be a slow process, taking many hours. There is no chance of a helicopter rescue. Weather : This area is occasionally affected by severe and sometimes dangerous storms, including thunderstorms. There are sometimes high winds. Forecasts are not so reliable. Mountain Hazards : In certain places you may be subjected to a slight risk of rock fall, or slip on icy terrain or steep snow. Guallatiri is an active volcano and so you will be exposed to a very low level of risk from any unexpected increase in volcanic activity.